There are so many great restaurants to enjoy when vacationing in Orlando and of course many of them are located right within Walt Disney World. 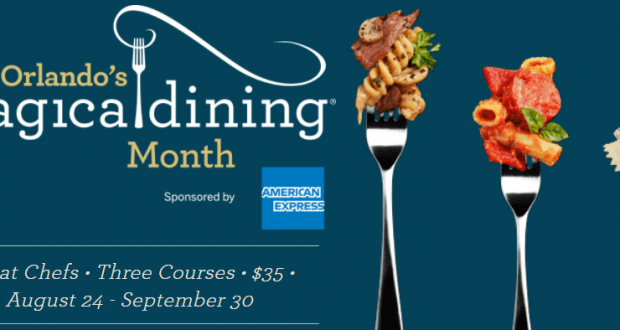 You will find various Walt Disney World locations included in Visit Orlando’s Magical Dining Month, which is sponsored by American Express. All of the locations that are including the event will offer a three course, prix fixe meal for $35 per person. The price for the meal does not include the applicable taxes and gratuities, so guests will want to consider that in the price. There are over 100 restaurants in the area that will participate with several from Walt Disney World. The event will begin on August 24th, 2018 and will run through September 30th, 2018. Even better, one dollar from each meal will benefit Best Buddies and Down Syndrome Association of Central Florida. We definitely recommend making reservations, but guests will be able to walk-in based on availability. Guests will need to request the Magical Dining menu when they are at the restaurant. Who plans to check out the Walt Disney World restaurants during Magical Dining Month?